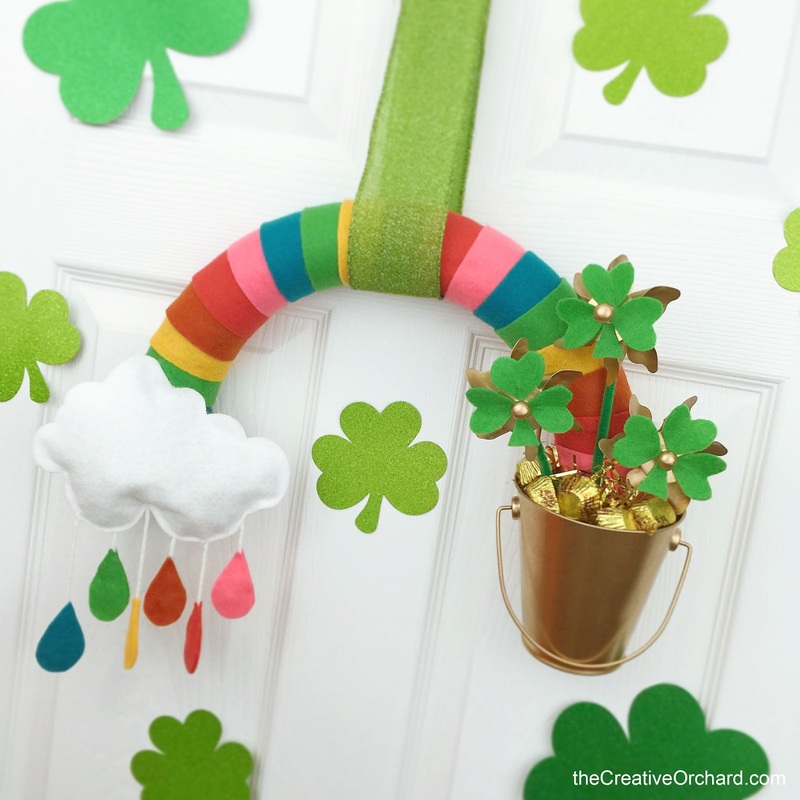 I'm OVER THE RAINBOW with how this crafty project turned out! 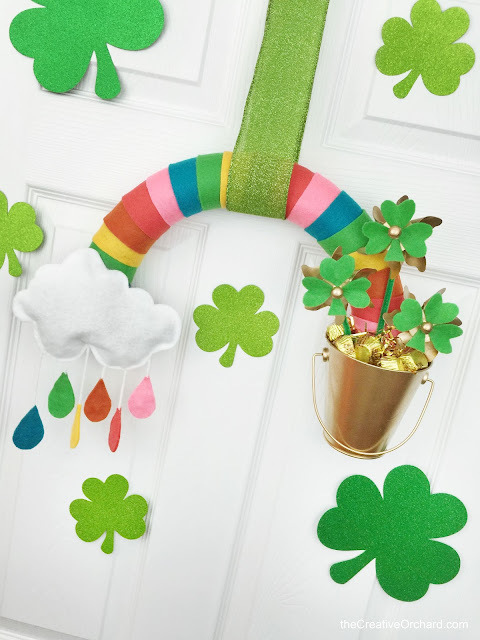 My last minute decision to attempt to CREATE some kind of St. Patrick's Day decoration to hang on a door in the foyer ended up being one of my proudest CREATIVE outcomes ever. I have never been a huge fan of traditional wreaths so while I was starring at the foam wreath form, I was trying to figure out how I could think outside the "circle". So when I noticed it had a seam on one side, I imagined what it might look like if I simply cut the wreath in half? 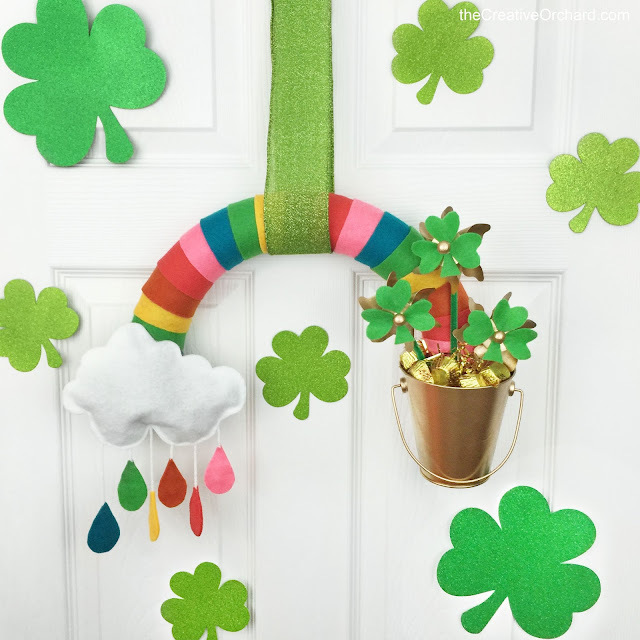 At that moment I knew by seeing that arched shape, I could CREATE a RAINBOW Wreath! "Technically" TWO wreaths if I choose to make another later. 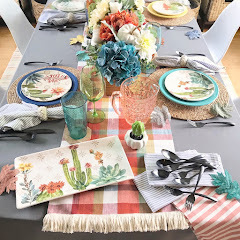 Instead of only going GREEN all over the place like most store-bought holiday decorations for St. Patty's Day, I decided to gravitate towards lots of RAINBOW colors (BIG surprise!) combined with touches of GOLD and GREEN. It wasn't until my project was complete and photos were taken that I had realized if I were to swap out the GOLD bucket and it's contents for less "holiday specific" accessories, the wreath could easily be used to DECORATE for other occasions/spaces as well. 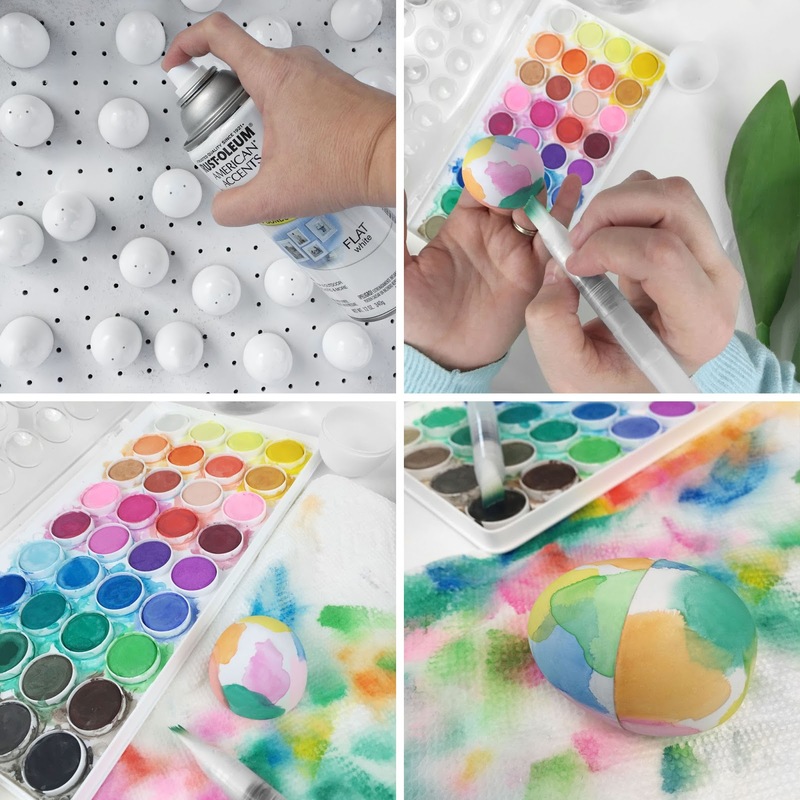 • BABY SHOWER/NURSERY - use a tiny basket with baby supplies, also change bright felts to pastels instead. Baby mobile maybe? 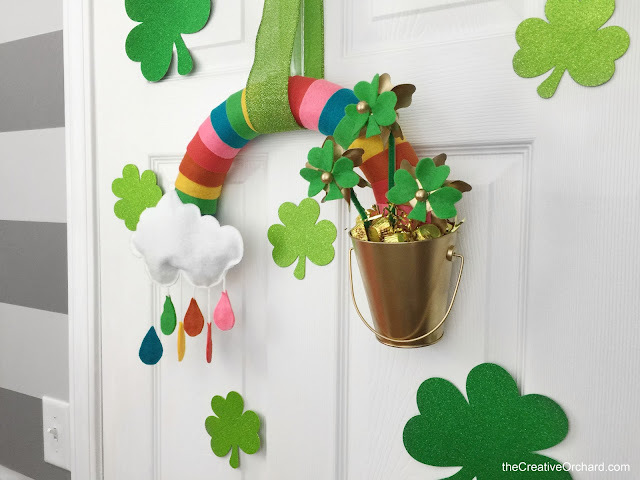 If you follow @theCreativeOrchard on social media or revisit this post again in the future, eventually I will try to provide another example of how to alter the RAINBOW Wreath concept. Let's face the facts, I already have another half of a foam wreath form and it would be a total waste if it was left unused plus there is very lonely door in my CREATIVE STUDIO that's screaming for something cute and colorful! 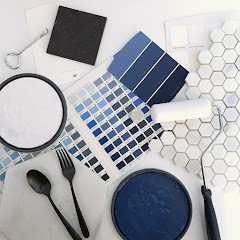 Sounds like crafty destiny to me! 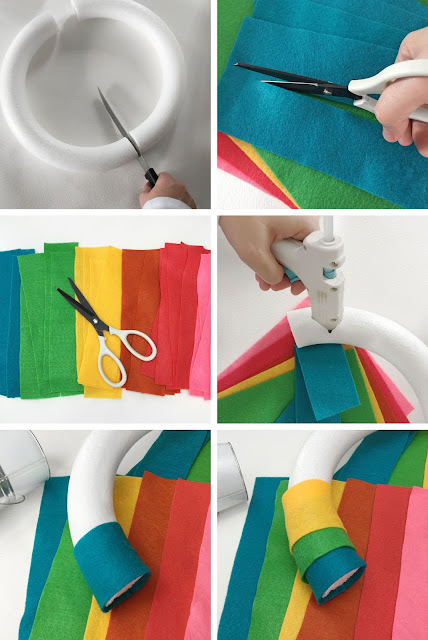 STEP #2: Using scissors, CUT 2" wide strips out of 6 sheets of felt in various RAINBOW colors. 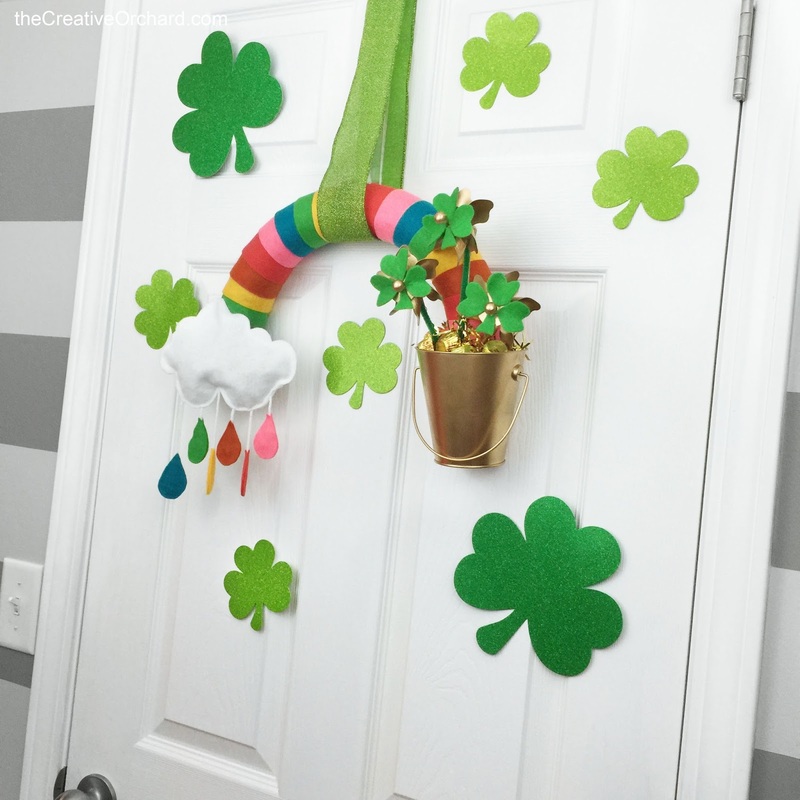 Make sure that the strips are long enough to wrap around the entire thickness of your specific size of foam wreath. 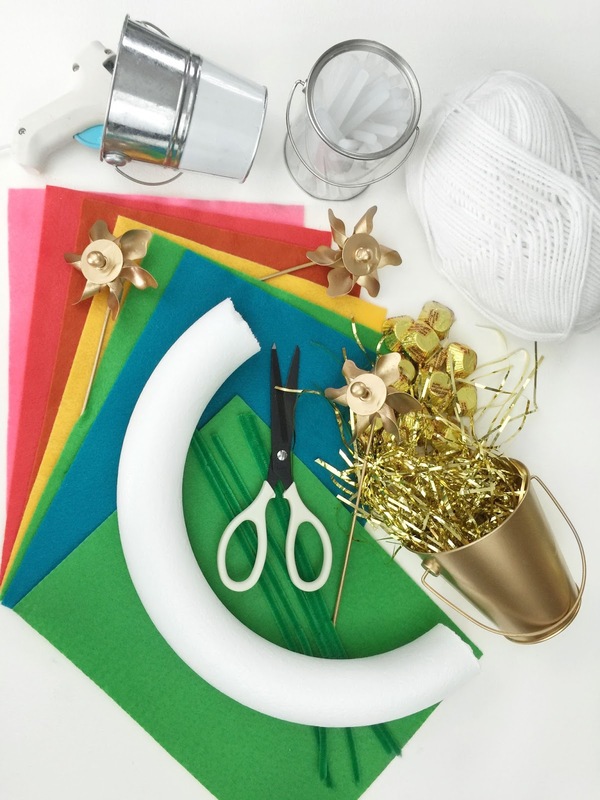 STEP #5: Go outdoors and spray PAINT a small metal bucket [Target] and three small plastic pinwheels with GOLD spray paint Let all items dry COMPLETELY! 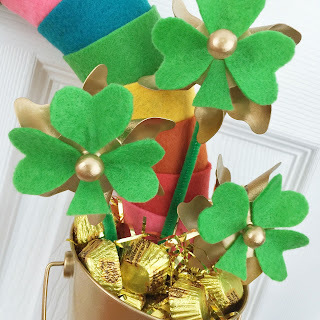 STEP #6: Hot GLUE the GREEN clover felt shapes onto the front of the pinwheels. Plus also hot GLUE GREEN pipe cleaners onto the fronts of the pinwheel sticks. 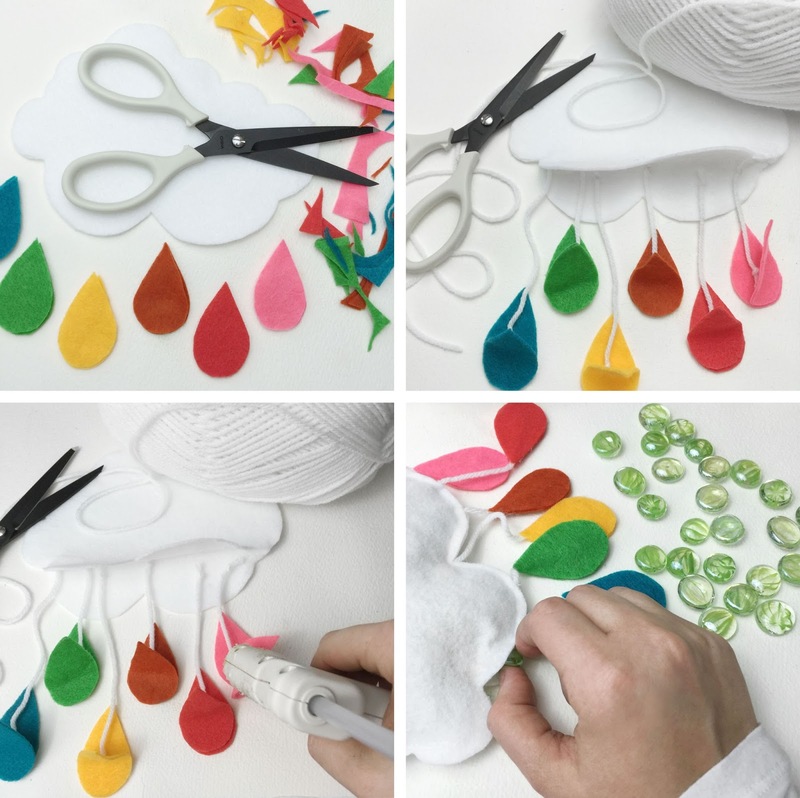 STEP #9: CUT six various lengths of WHITE yarn and tie knots at each top and bottom for each raindrop to hang from. Hot GLUE the top of each knot (6) inside the bottom of one side of the cloud and each bottom knot (6) inside one side of each raindrop. (See Photos) Then hot GLUE all six of the raindrops shut. 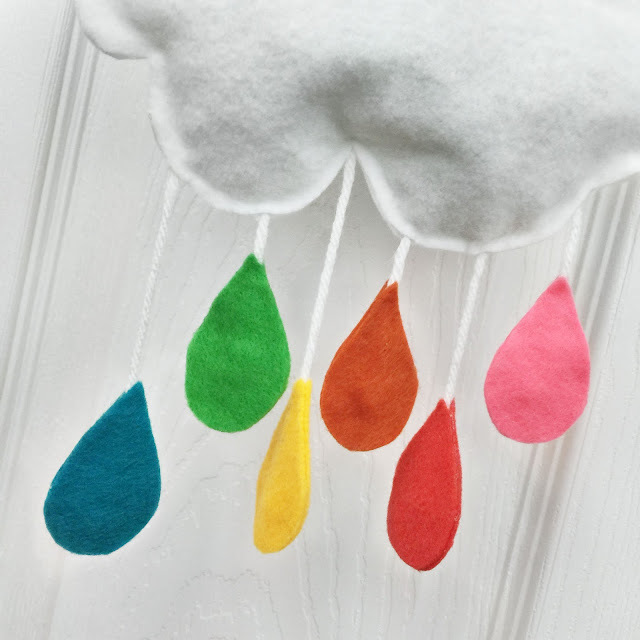 STEP #11: Lastly, using a "generous" amount of hot GLUE, attach the felt cloud pouch with hanging raindrops to the bottom other side of the RAINBOW Wreath. 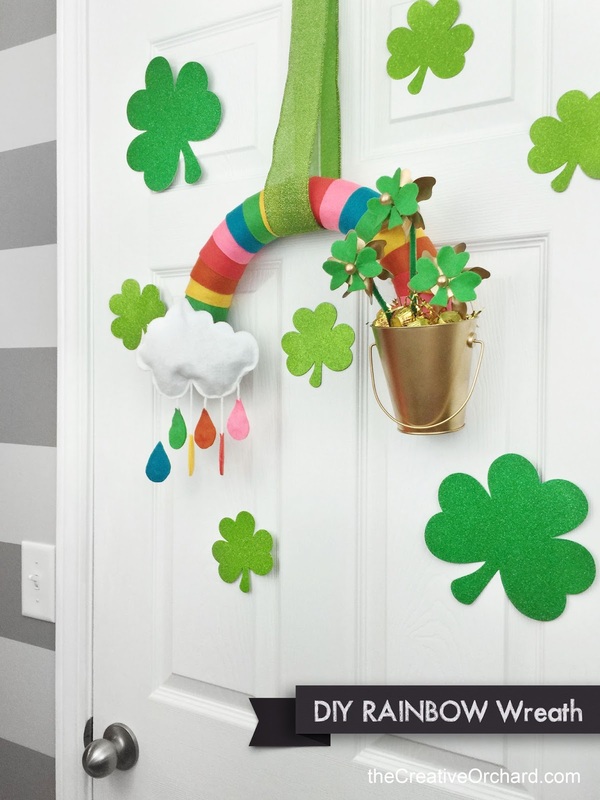 Now you can proudly DISPLAY your RAINBOW Wreath for St. Patrick's Day by using a large loop of wide ribbon to hang it. I hung mine on a door but it would also look nice over a fireplace, window or large mirror. Want to SHARE this CREATIVE IDEA? PLEASE credit Renee Hagloch of theCreativeOrchard.com and provide a direct link to this post. If you share on Social Media please credit by tagging photos and also include the appropriate handle such as @thecreativeorchard (Instagram) @theCreativeOrchard (Facebook) @creativeorchard (Pinterest)@creatvorchard (Twitter) SHARING is CARING - THANK YOU!!! 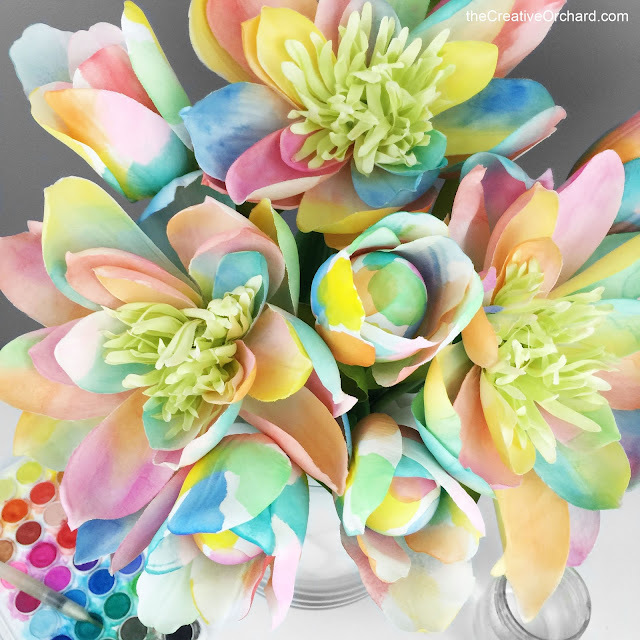 CREATE: Watercolor Florals PLUS Surprise Inside! Saying "Hello" to SPRING projects a little early this year! 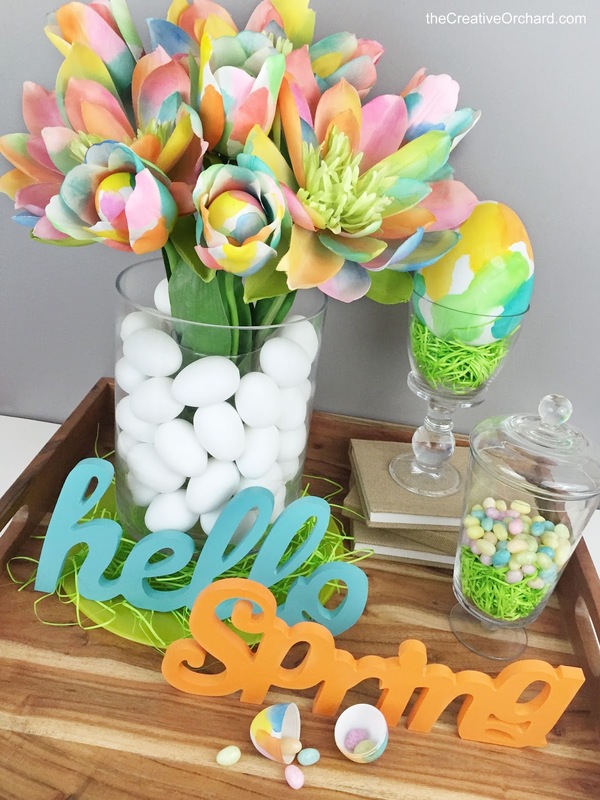 Normally the only kind of plants inside my home are succulents, cactus, vines or tropical ones, but I wanted to change things up a bit this upcoming season by adding some FLOWERS to the mix. 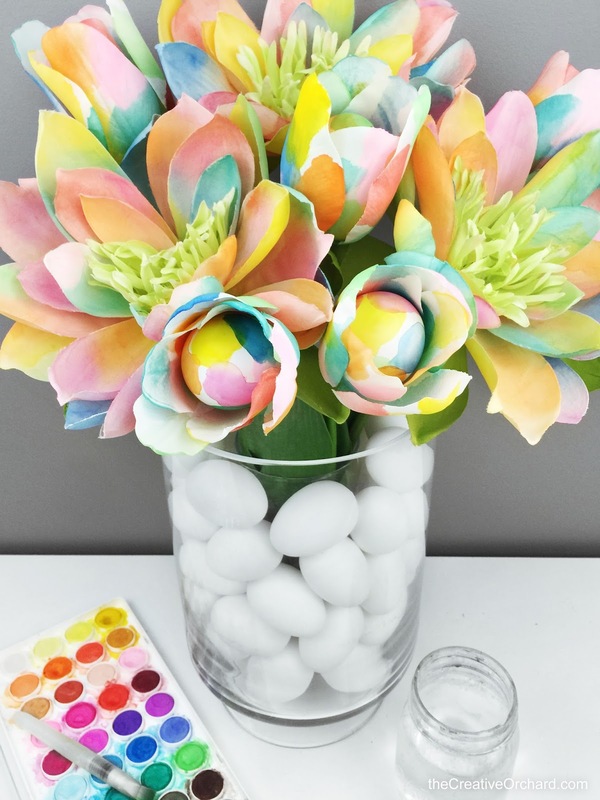 Lately a lot of the lifestyle bloggers I follow have been showing off such beautiful FLOWER arrangements with TULIPS, so when I went to purchase some, I decided to get faux FLOWERS from the FLORAL department at the local craft store because it kinda bums me out when the real ones die after a week. 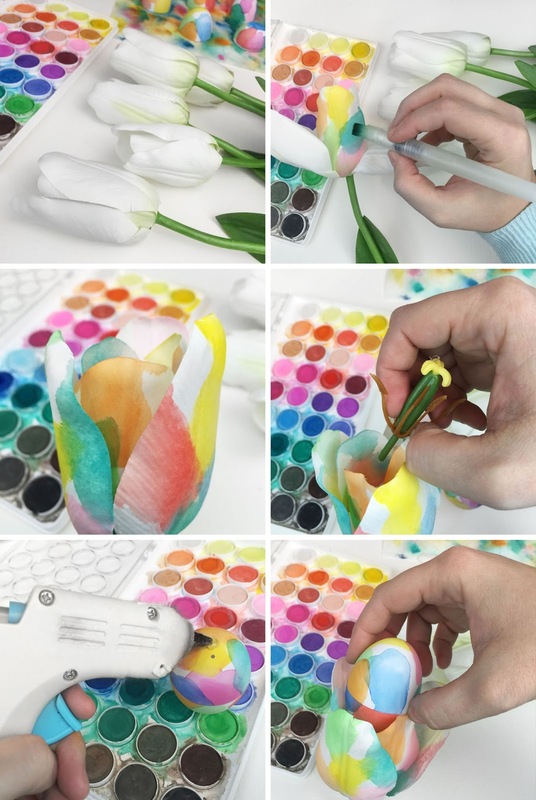 Oddly enough, I ended up choosing white TULIPS and LILIES which is very unlike me considering I LOOOOOVE COLOR so much! 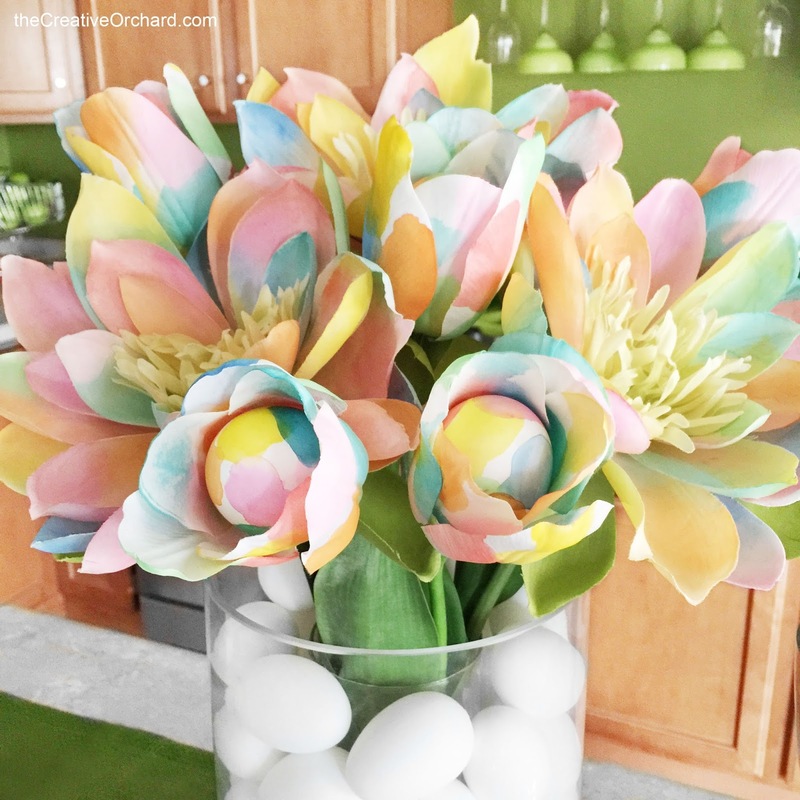 A couple weeks beforehand I had also found plain white plastic Easter eggs and thought I could use them to fill the inside of the vase to hide the ugly fake stems. 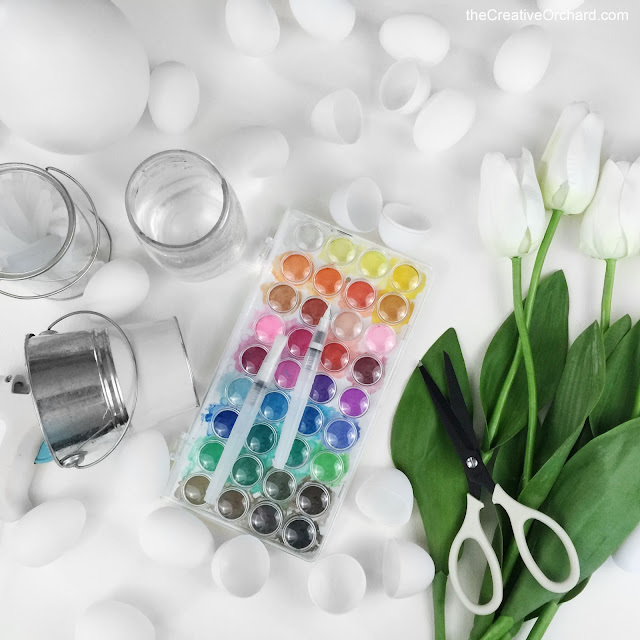 At first my plan was to paint the white Easter eggs with WATERCOLORS but then a BRIGHT IDEA popped into my head and I thought... what if I did the opposite and left the eggs white but hand painted the white FLOWERS with WATERCOLORS instead? Since they're fake anyways, I might as well embrace it and turn the bouquet into a FRESH, BRIGHT and COLORFUL piece of 3-dimensional artwork. But the Designer in me, thought that it would be way too overwhelming to PAINT both the vase filler eggs and the FLOWERS so it was best to keep the eggs white for contrast. 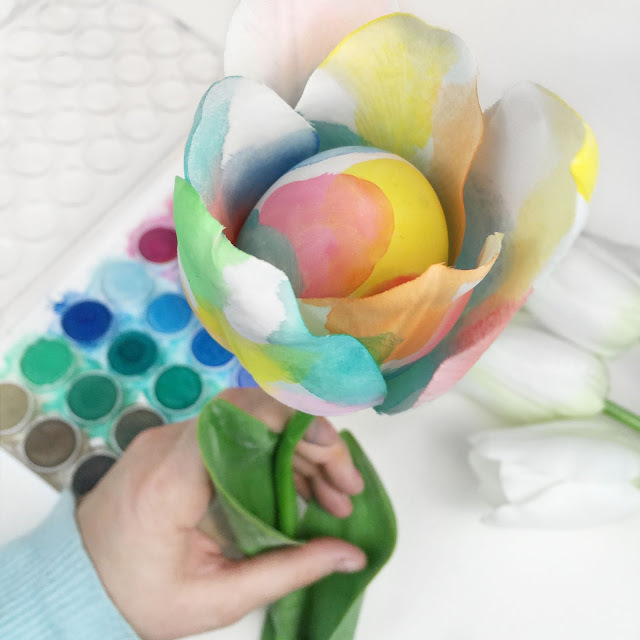 PLUS to take the WATERCOLOR FLORALS one step further, I thought it would be cool to put a SURPRISE Easter egg hidden inside each TULIP! Ah ha! 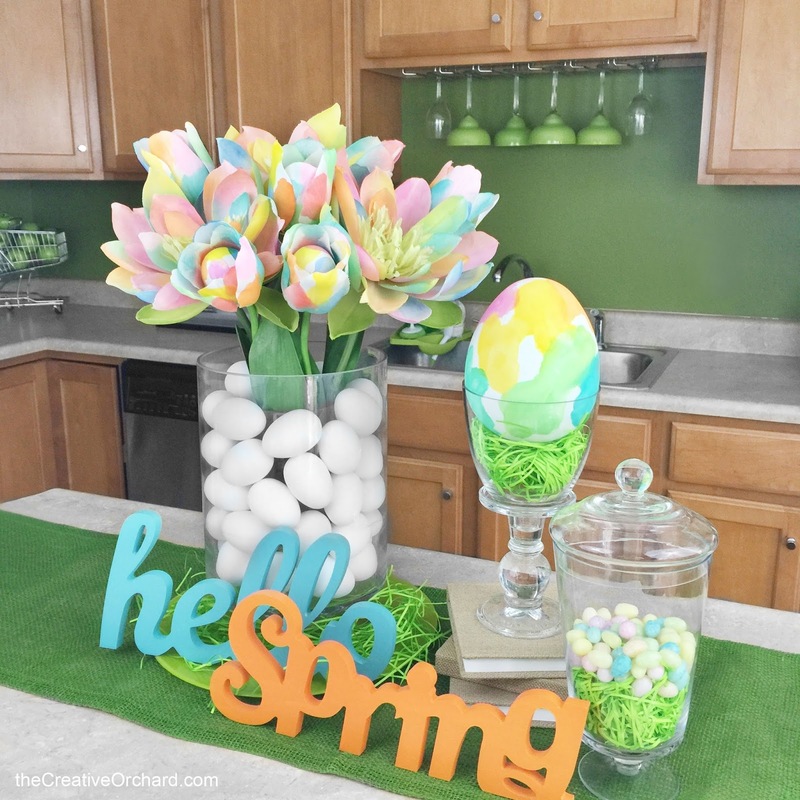 Another place to hide my jelly bean stash from the kiddos. Lol. 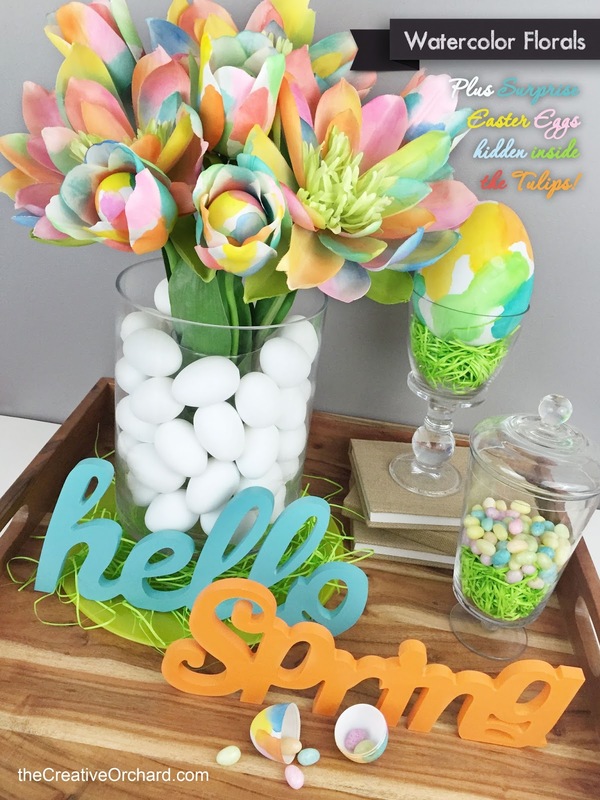 The final product turned out more CHEERY and BEAUTIFUL then I had imagined!!! The painting process was surprisingly so easy that the hard part is actually going to be deciding where to put them in my home because they make every room look so pretty. 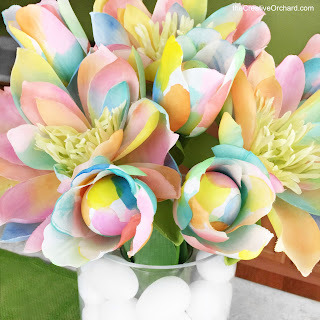 Maybe I'll just float them around from room to room spreading some SPRING cheer or another BRIGHT IDEA would be to make more WATERCOLOR FLORALS because I enjoyed the process so much! If I do end up taking more photos of them on display in various locations, I will update this post and add them to the bottom. 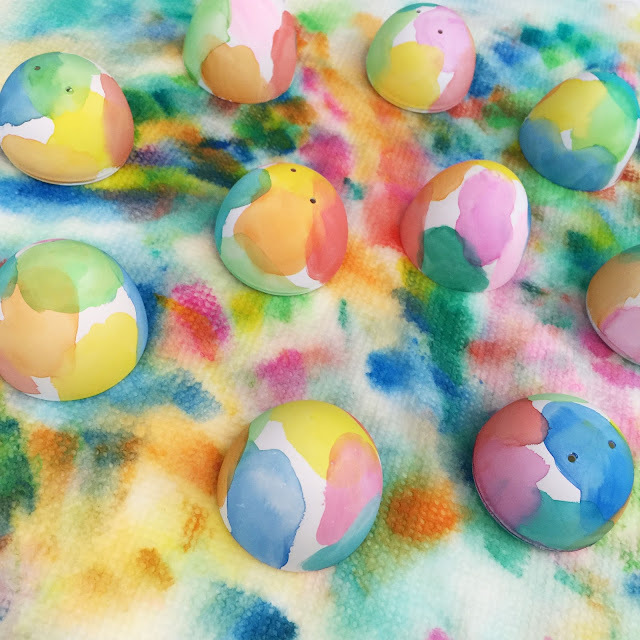 View the images below to see the results for yourself and to get a glimpse of the crafting process in case you would like to paint your own. 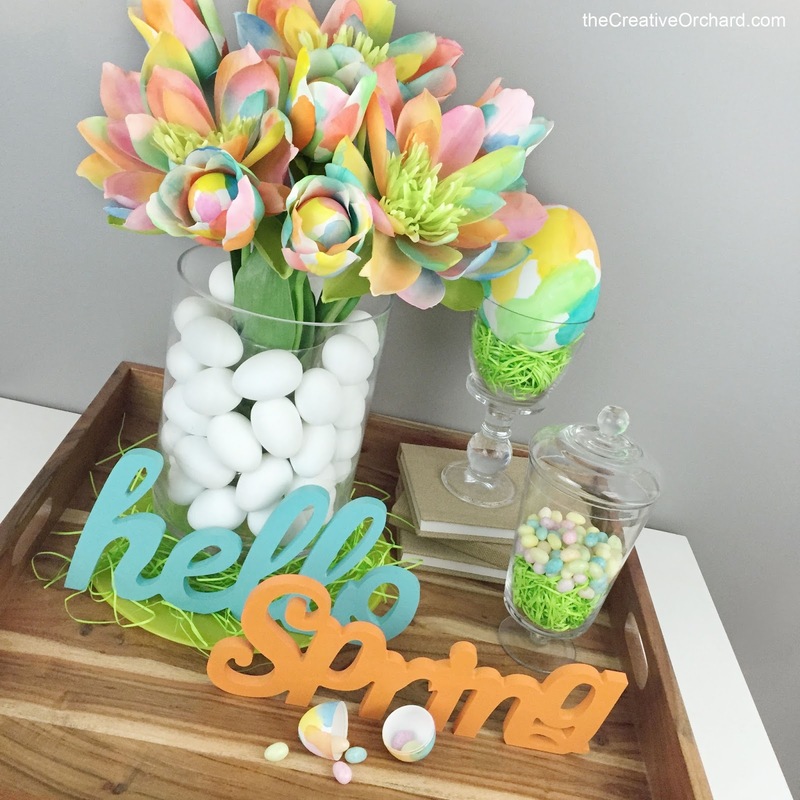 FYI: I will be making lots more SPRING and EASTER crafts for #nationalcraftmonth so if you are on Instagram follow @thecreativeorchard or check out my latest hashtag #createspring. Can't wait for SPRING to get here!!! 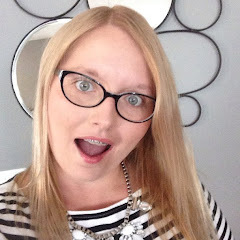 If you share on Social Media please credit by tagging photos and also include the appropriate handle such as @thecreativeorchard (Instagram) @theCreativeOrchard (Facebook) @creativeorchard (Pinterest) @creatvorchard (Twitter) SHARING is CARING - THANK YOU!! !